If, like many others, you feel implant dentistry is the choice for you, we ask that you undergo a dental/radiographic examination and health history. During these consultation visits, your specific needs and considerations will be addressed by Dr. Hughes. Your questions and concerns are important to us and our team will work with you very closely to help make your procedure a success. 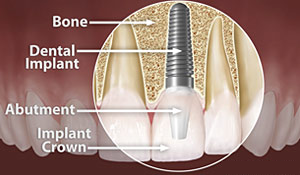 Dental Implants Securely Solve the Problem!